How long ago were the oldest rock art sites created in Canada? A range of dating methods have been applied to rock art sites over the years, but research efforts have yielded more or less reliable results. However, it can be said that this “artistic” means of expression existed at least 5,000 years ago and has continued over millennia. Researchers use relative dating methods to assign a general time period to a site or motif or determine their chronological ordering. For instance, when a rock art site is unveiled on a rock outcrop covered by soil, the layer of sediments covering the site can be dated approximately by association with temporally diagnostic artifacts found within or above it. Rock art will be older than the sediment layer that covers it. Accordingly, some researchers have proposed that the Mud Portage petroglyphs in Ontario are more or less 7000 years old. Another method is to make a stylistic comparison between rock art motifs and the portable art of a given culture. This method reveals that rock art can be considered as an ancient tradition, because objects decorated with similar motifs sometimes date back several centuries. In other cases, motifs of horses, firearms and European ships clearly indicate their later historical origin from the time when Indigenous Peoples interacted with Europeans. Ethnohistorical and ethnographic sources rarely account for rock art sites created in recent centuries. However, researchers know that certain images represented at the Agawa Bay site, in Ontario, were painted in the 17th and 19th centuries. Another site located in Manitoba of unknown name was painted at the beginning of the 20th century. 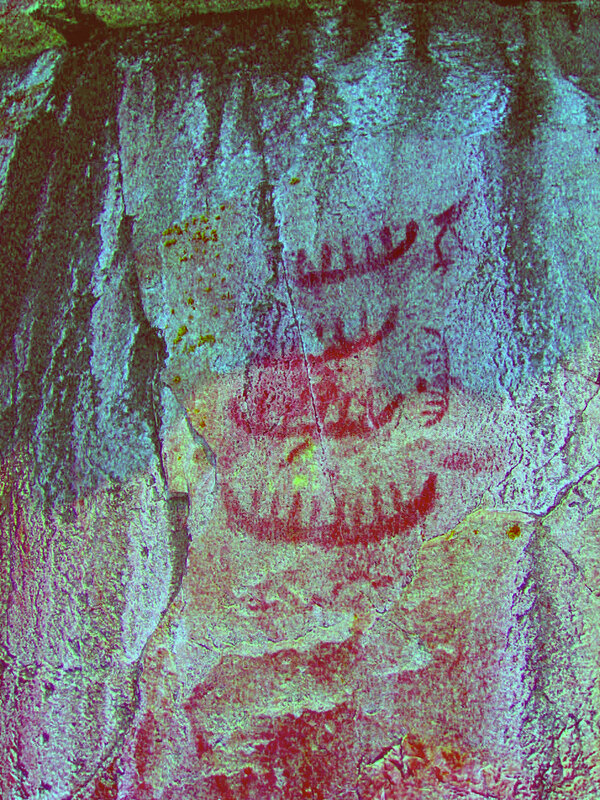 Images at the Agawa Bay site, in Ontario, dating back to the 17th century and representing a fleet of Anishnabeg canoes on the warpath against the Haudenosaunees. Leading the canoes are totem animals: a crane, an eagle or a Thunderbird, and a beaver. In the last twenty years or so, radiometric dating techniques have been used to better determine the age of rock art images. Although seldom used in Canada, the accelerator mass spectrometry (AMS) method was applied to the Pepeshapissinikan site and it indicated that the site is around 2000 years old. In recent years, researchers have tried to use other dating methods, including optically stimulated luminescence (OSL). Unlike carbon-14 dating, this process is not used to date organic matter, but rather the last moment when minerals, such as quartz and feldspar, were exposed to the sun before being covered by a pigment. However, this method does not seem effective on Canadian Shield rocks.